commented on "Custom made higher bed base with storage drawers." Custom made higher bed base with storage drawers. Need storage drawers under your bed? Or need a higher bed base or frame? We can make it! 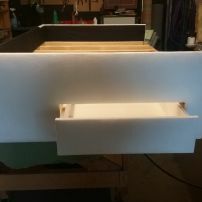 We can custom make bed bases to your requirements whether you prefer drawers on the sides or ends. We can also make bed bases or frames to be lower or higher.